Home / feature / funny / game shows / games / television series / tv series / videos / 10 Most Weirdest and Funniest Game Shows of All Time! 10 Most Weirdest and Funniest Game Shows of All Time! When we talk about the most bizarre and weirdest game shows out there, the Japanese always top the list as for some reason, they always manage to come up with some of the craziest ideas for game shows that no one would have ever thought of! Some of their crazy ideas turn out to be inspiration for several game shows from other countries, typically in the U.S., U.K., Hong Kong, Taiwan and China. Nevertheless, there are also some other classic game shows that are really original and authentic like, “Who Wants to be a Millionaire”, “Are You Smarter than a Fifth Grader”, “Wheel of Fortune” and “Family Feud”, but they are definitely not cray cray like the game shows in Japan! Here we have listed out our 10 most favourite game shows of all time from around the world that are just the most weirdest and funniest! "Takeshi's Castle" is probably one of the most famous game shows out there that the world would remember as it has become a global cult television hit. Originally aired on the Tokyo Broadcasting System (TBS) between 1986 and 1990, “Takeshi’s Castle” featured famous Japanese comedian and actor Takeshi Kitano as its host! In the game show, he played a count who owns a castle and sets up difficult challenges for players to get to him. The show has 29 international versions throughout the world. The American version was renamed as “MXC” (Most Extreme Elimination Challenge) with re-edited footage from the Japanese game show. As the most famous and longest-running TV program on South Korea's Good Sunday which first aired in 2010, the “Running Man” variety show sees the emcees and guests complete missions at certain landmarks to win the race. Over the years, the show has shifted to a more familiar reality-variety show concept focused on games. Hosted by Korean talents Yoo Jae-suk, Ji Suk-jin, Kim Jong-kook, Haha, Lee Kwang-soo, Gary and Song Ji-hyo, the show is widely popular in Asia especially among Hallyu fans as it has been fan-subbed and dubbed into various languages for all to enjoy! Making its debut in 1995 on TVB, the Hong Kong variety show has lasted for 18 years and 10 seasons due to its huge popularity! Hosted by renowned actor, director and producer Eric Tsang who is usually accompanied by his two assistants Jerry Lamb and Chin Kar-lok, each episode of the show features popular Hong Kong celebrities or personalities as the guest stars who have to participate in different party games. They have to also perform ridiculous and sometimes sexually provocative acts! The show initially ended its run back in 2005, but TVB soon aired a spin-off series called “Super Trio Wonder Trip” in 2008, with the purpose of introducing a series of new games that are derived from various game shows around the world. With a total of 31 seasons since 1997, this Japanese sports-themed game show has been aired in more than 155 countries with an edited version titled “Ninja Warrior” screened in at least 18 countries. The competition has 100 competitors who are usually athletes attempting to complete a four-stage obstacle course. The show is originally one of the spin-offs of “Muscle Ranking”(another Japanese sports competition) but it became an independent program when “Muscle Ranking” got canceled. "Guess" is a Taiwanese variety show hosted by famous personality Jacky Wu, which started airing in 1996 and ended its run in 2012. The show had two segments; “The truth cannot be faked” and “Do not judge a book by its cover”. The first segment had four people invited where each of them claim that they are able to accomplish something seemingly unbelievable. However, only three of them are telling the truth. Invited celebrities will then have to identify the liar; if they fail to guess correctly, they will be punished! Meanwhile, the second segment is a mini segment with five people competing for a certain title. Invited celebrities are again required to guess which one of them will be the eventual winner. The winner is usually picked by a panel of experts. 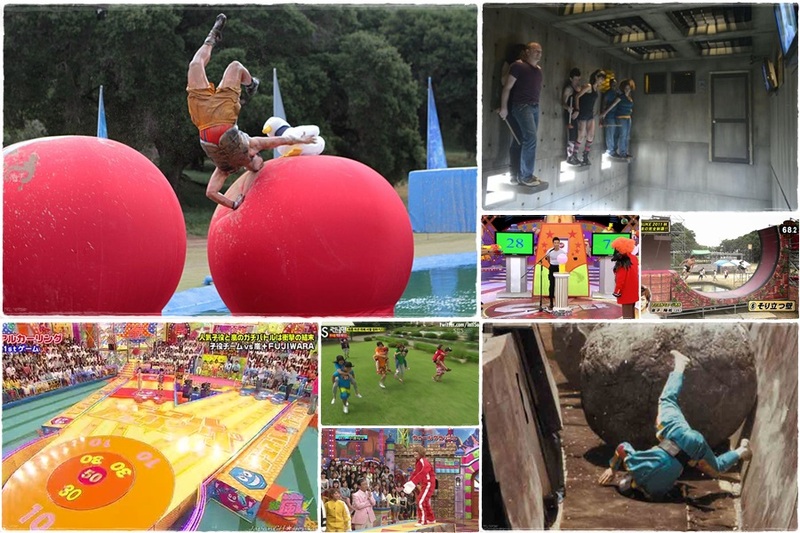 In this American game show, contestants need to compete with one another in what was billed as the “world's largest obstacle course”. The show had commentary by John Henson and John Anderson, while Jill Wagner acted as the on-location presenter. The show ran from 2008 until 2014. Japanese broadcaster TBS filed a copyright infringement lawsuit against ABC which aired the show, claiming that "Wipeout" is a copycat of several of its classic Japanese competition game shows, most notably “Sasuke” and “Takeshi's Castle” due to the similar concept and game style. The first season of “Dream Team” was aired for six years between 1999 and 2003, but the second season which started to air in 2009 is more successful as it features more Kpop celebrities that we know of today. The show is basically an organised sports variety program where two teams – men and women – will have to complete the game consisting of various obstacles, in the shortest possible amount of time. Before the main game, the contestant will first need to play an audience 'service game' to show their appreciation to the fans who came to support them. Hosted by all the five members of the famous Jpop idol group, Arashi, the game show features the Arashi members, including one surprise guest, battling against the guest team in various game challenges which sometimes changes on a weekly or monthly basis. Normally, the opposing team is made up of famous celebrities or personalities like famous athletes, idol groups or maybe even international stars which had previously included Tom Cruise, Cameron Diaz, Andrew Garfield, Emma Stone, Jamie Foxx, Will Smith, Tommy Lee Jones, and more. "VS Arashi" began airing on Fuji TV in 2008 and is still running up to today. It is unknown why the show was named as “Tokyo Friend Park 2” as there is no “Tokyo Friend Park 1”, but the show started in 1994 and features celebrity guests (like many other Japanese game shows) competing for the top prizes in several games throughout the show. The show ended its run in 2011 because the ratings started to drop drastically since the broadcasting time change in 2009. An American version of another famous Japanese game show, “Dero”, “Exit” has four teams of two contestants who compete to escape from four rooms that have different challenges each. Each team must use their thinking skills and teamwork to solve the puzzles given within a time limit to win the grand prize. If they fail to do so, they will suffer possibly “lethal” consequences. The first season of the show was aired on Syfy on 4 June 2013 and ended on 9 July 2013. Since then, there has been no announcement on new season or whether the show has been cancelled completely.